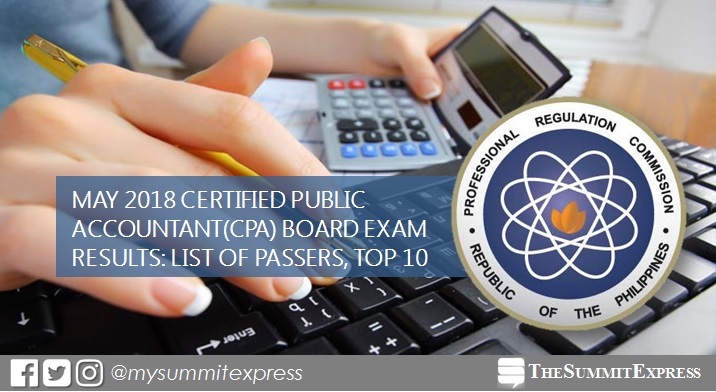 MANILA, Philippines – (Updated May 28) The May 2018 Certified Public Accountant (CPA) board exam results including the official list of passers, topnotchers (top 10), top performing schools and performance of schools are officially released online today, Monday, May 28 or in five (5) working days after the last day of exam. UPDATE: 2,843 out of 9,830 passed the exams. The Professional Regulation Commission (PRC) conducted the CPA licensure exam in the cities of Manila, Baguio, Cagayan de Oro, Cebu, Davao, Iloilo, Legaspi and Tacloban on May 13, 20 and 21, 2018. The second day of exam, originally scheduled on May 14, was moved to the 20th due to the Barangay and Sangguniang Kabataan Elections. The members of the Board of Accountancy who gave the licensure examination are Joel L. Tan-Torres, Chairman; Gloria T. Baysa, Vice-Chairman; Samuel B. Padilla, Arlyn S. Villanueva, Gervacio I. Piator, Thelma S. Ciudadano and Marko Romeo L. Fuentes, Members. According to PRC Resolution No. 2017-1068, the target release of results for the recent CPA board exam is on Friday, May 25 or in four (4) working days after the test. 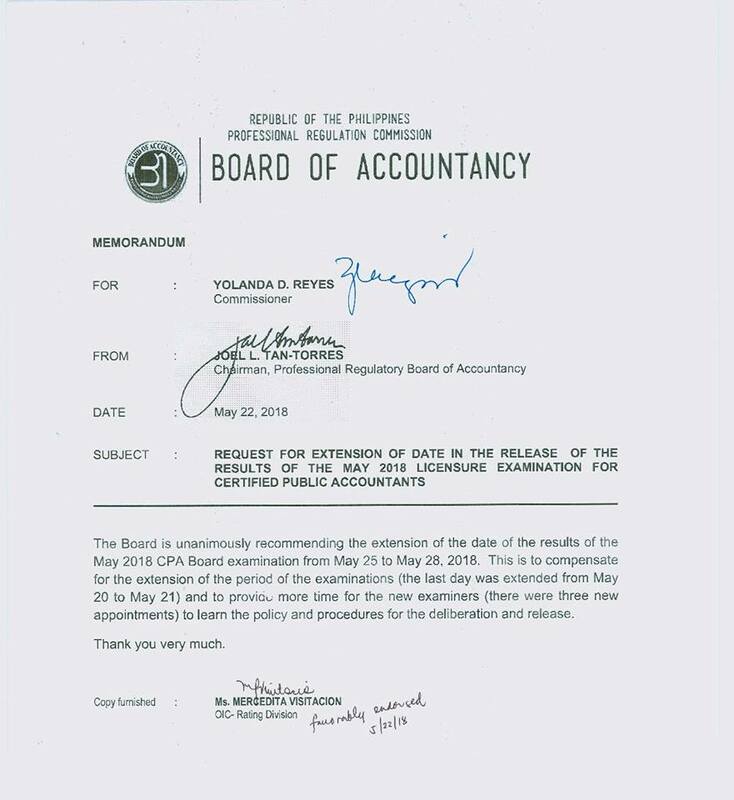 May 25, 2018 UPDATE: PRC BoA shared on Facebook a memorandum seeking for the extension of target release date of CPA board exam results from May 25 to May 28. May 28, 2018 Update: CPA board exam results are out TODAY! In the same period last year, CPA board exam results were announced in five (5) working days. A total of 3,389 out of 9,645 (35.14%) successfully hurdled the grueling exams. University of San Carlos (USC) graduates Vianca Pearl Inot Amores and Marianito Jesus Berdin del Rio shared the top spot with 92.67%. Meanwhile, results may be released online ahead or beyond the schedule without prior notice.